Whales are denizens of the deep, caretakers of oceanic wisdom, and record keepers for planet earth. They communicate by means of song stories and telepathy. Whales remember how to travel with grace of movement over thousands of miles, following ancient migration routes. The four horizontal figure eights, or möbius strips, suggest that their wisdom is greater than time and depth . . . it is Infinite Wisdom. Pulling this card could find you seeking a measure of wisdom to help you comprehend a situation. Something does not make sense and you are having difficulty understanding why events are occurring as they are. Quiet your thoughts and allow your consciousness to float in this fluid blue ocean. Tune in to the wisdom the humpback mother and calf embody. You may want to trace an infinity symbol on your forehead or palm, or move your hands in a flowing figure eight to help you connect with this infinite wisdom. Telepathically plug in to the records kept by these magnificent cetaceans. Ask this infinite source to offer you the wisdom you require to bring greater understanding to your thoughts. 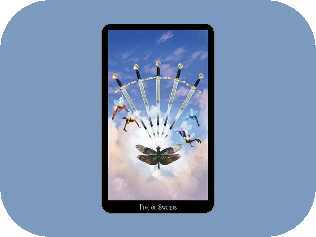 If your inquiry is not one of confusion, this card confirms that you are indeed in touch with insight and good judgment, and you may be assured that your decisions will be sound. Celebrate your own wisdom. Today you may not feel so wise. Relax into the knowing that this too will pass. 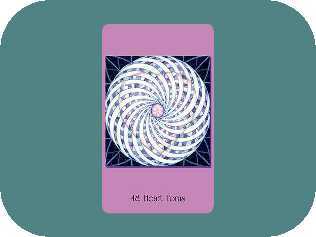 Presented by Sacred Geometry Cards for the Visionary Path app from The Fool’s Dog. The stellated dodecahedron is associated with unity consciousness, or Christ consciousness. 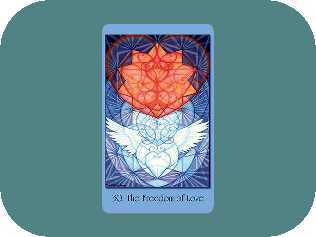 Combined with golden spiral hearts, this card creates a matrix through which we can realize that when we live in integrity and with heart energy there is true freedom. Our journey of evolution is our journey toward unity consciousness. Meditate with this image and feel into your connection to divine oneness and universal love. Visualize yourself as part of every particle of energy in creation. Sacred Geometry affirms our oneness and provides us with a language to better understand our place in it all. Love is the key that unlocks this language and helps us more fully realize our divinity. Freedom is the force that offers us an opportunity to realize an expanded view of our humanness and our place in the cosmic order. Take this experience into your heart and see it as sprouting wings. See yourself flying on the wings of universal love and experience the freedom of knowing you are never separate but are truly an integral part of the divine order. Separation is a false story that history has handed you. Open your heart and let universal love fly in. Keywords: Embarrassment, illusion, trickery. Learn to laugh at yourself and keep going forward. Reversed: Humiliation, carrying a grudge, conflict with a domineering person. 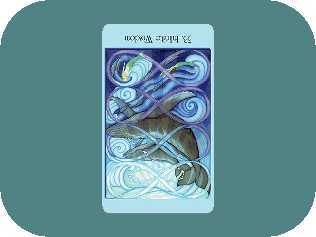 Presented by The Witches Tarot app from The Fool’s Dog. 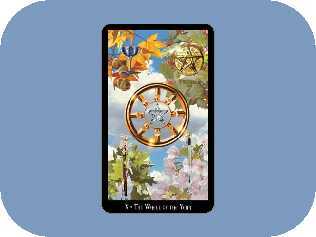 Keywords: The Wheel of the Year, celebrating the sabbats and esbats. Good luck. Working with the energies and magick of each season. Reversed: A period of bad luck. Feeling disconnected from the seasons and rhythms of nature. Seasonal affective disorder (wintertime blues). The torus is a piece of Sacred Geometry that when viewed as three-dimensional looks rather like a doughnut. The human heart has seven muscles that form a torus, and it is the shape of Earth’s magnetic field. This toroidal energy connects you with the intelligence of your heart and asks you to become conscious of the effect emotions have on your ability to experience life wholly. Emotions open your heart and can lead to a deeper connection with Self and others, allowing you to feel more at peace and in balance. Emotions can also baffle your intellect and stir up confusion. Integrating head and heart, mind and emotions is the expression and function of the intelligence of your heart. Meditate with the heart torus. Sit within its dynamic movement and really “feel” its vitality as you knowingly connect with your heart. Consciously experience the emotions that arise. Bless what you are feeling and ask how this may inform what is occurring in your life today. Allow yourself to “feel” gratitude for your very human ability to experience emotions. Honor the intelligence of your heart. You have been too much in your head of late. Enter the heart torus and consciously reconnect with your heart.